The Cresta Run is bustling with activity. It’s the end of February, and today is the day of the Claude Cartier Challenge Cup. 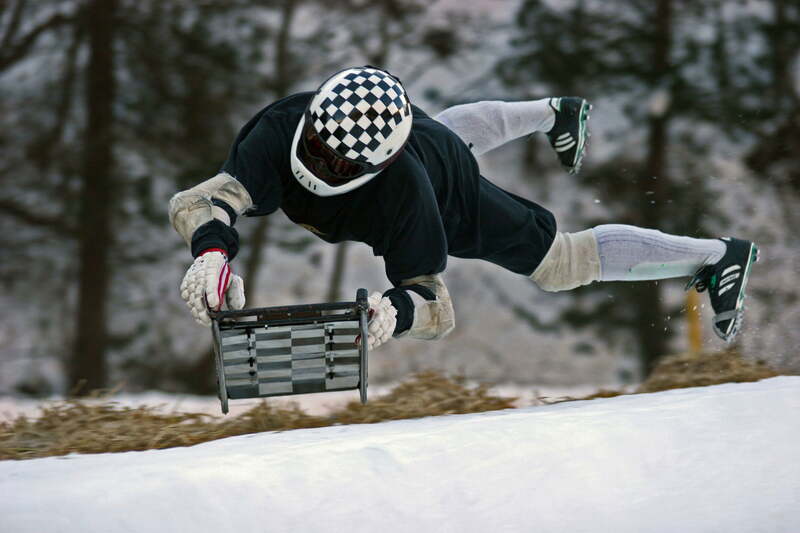 Lying head-first on a 35-kg toboggan, the participants race down the ice channel towards the finish in Celerina at a maximum speed of 138 km/h. Pure adrenalin. 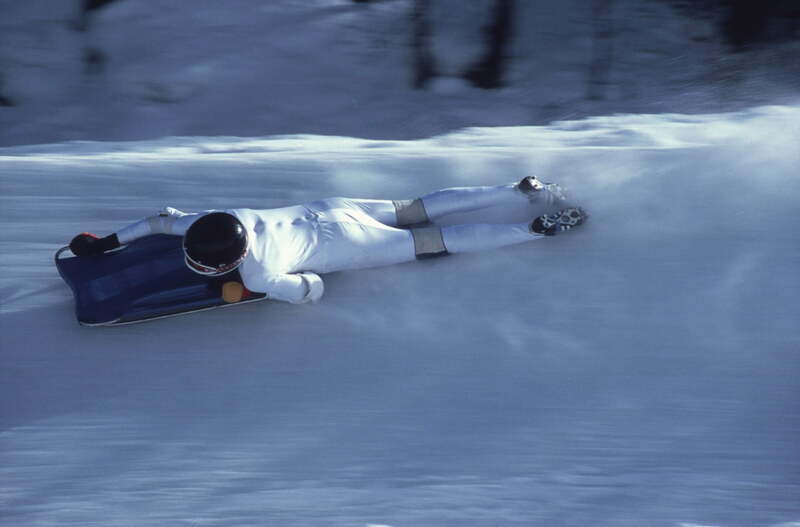 Who on earth would want to race down an ice track voluntarily at such speeds? Two of the daredevils are British: father James Sunley and his son Casper. Do they ever feel fear on the Cresta Run? “I’m extremely apprehensive before I ride the Cresta course. You always have to try to take the best line. 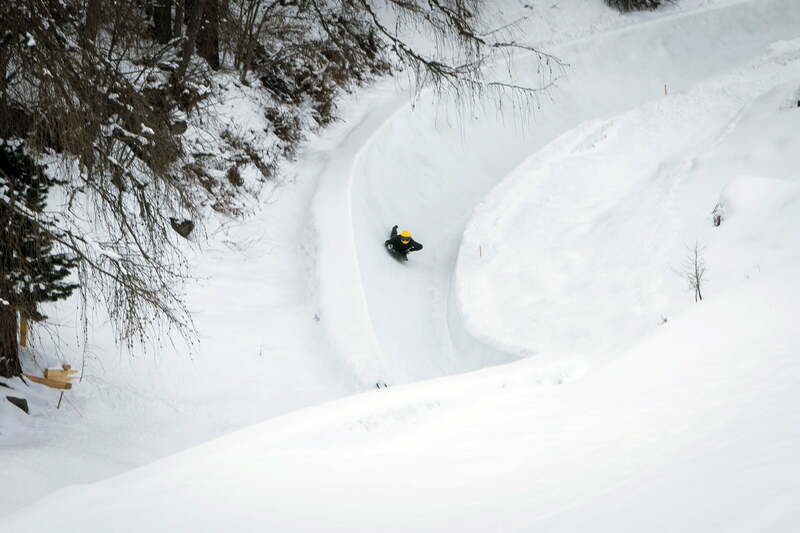 The problem is that at high speeds, you can only see about five to eight metres ahead,” says Casper Sunley. “You always have to treat the track with respect and not become careless. Anyone who claims they’re not even a little bit afraid before the race is lying,” adds James Sunley. 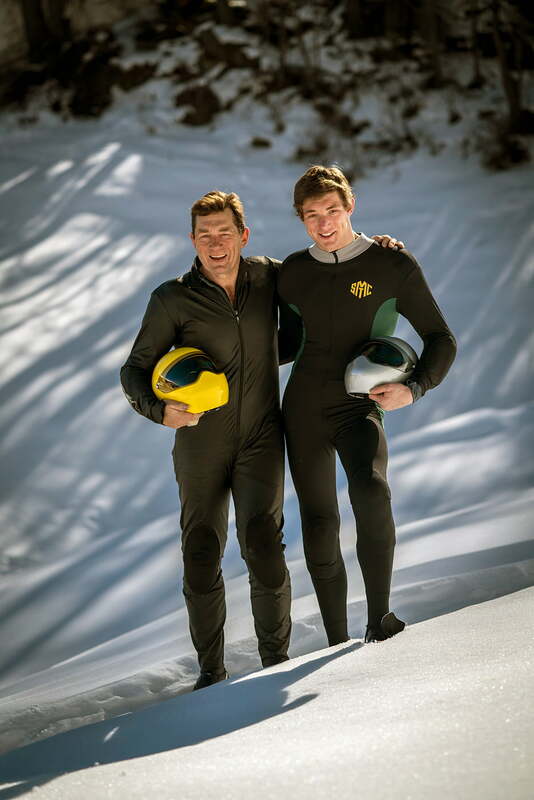 Two of the daredevils are British: father James Sunley and his son Casper. 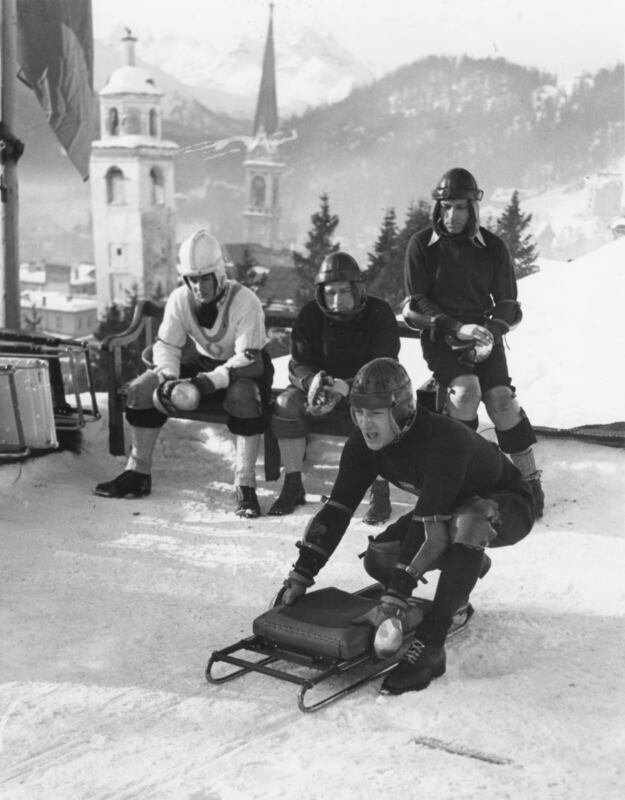 It was four Englishmen who introduced the popular toboggan race to St. Moritz. 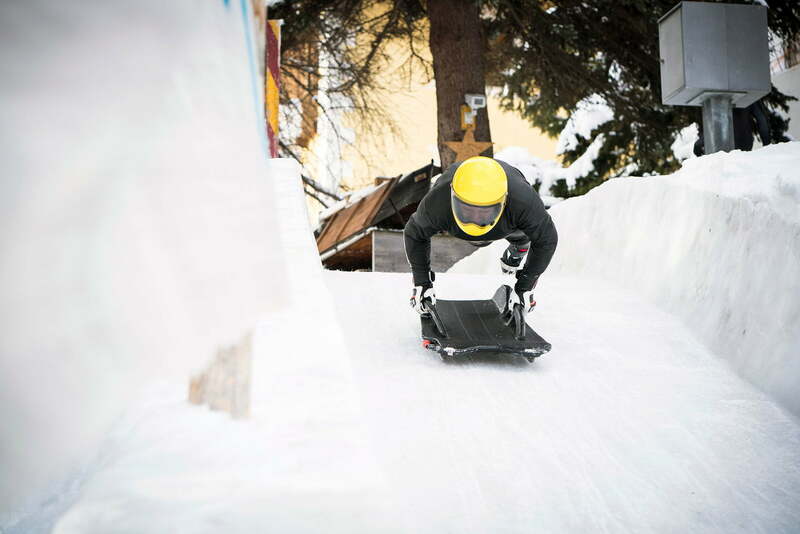 That is why impeccable English is spoken at the St. Moritz Tobogganing Club (SMTC) even today. And as ever, the president of the renowned SMTC, James Sunley, is also an Englishman. Half of the 1,240 Club members are also British. 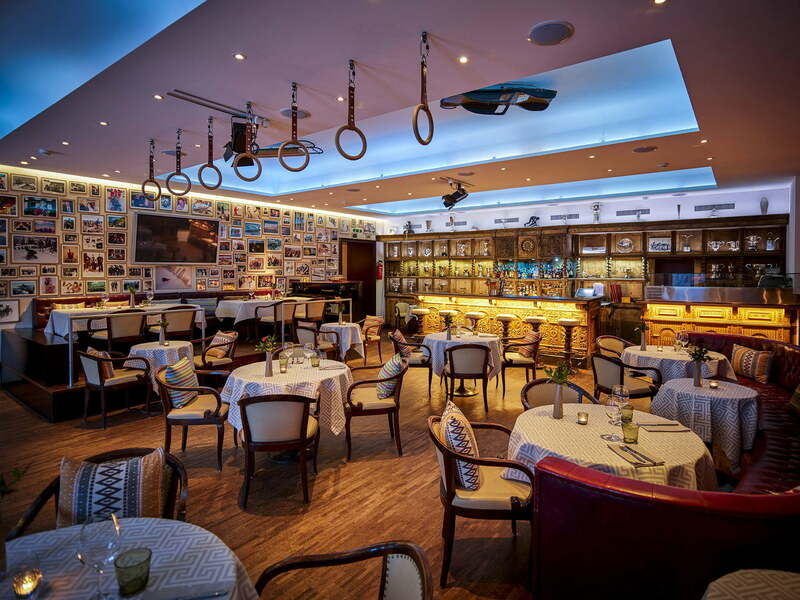 The fact that they came to St. Moritz at the time, stayed, and kept returning is all down to one man who had a brilliant idea in the summer of 1864: Johannes Badrutt, former owner and manager of the Kulm Hotel. He offered his English summer guests the opportunity to experience the beauty of the Engadin in winter as well. If they didn’t like it, Badrutt would reimburse their hotel costs. An offer that the English guests were all too happy to accept. So they came, and they wanted to have a good time. Once again, it was Johannes and Caspar Badrutt who provided and financed the first Cresta Run in 1884. Then, in 1887 the Club was founded. Badrutt only had one condition: the club had to be run by a Briton! Casper and James Sunley are discussing the weather conditions. “It’s slowly getting warmer and the ice is starting to melt, so we have to ride early. The perfect racing conditions are after a cold night with a slight thaw in the morning. That thin film of water on the ice is perfect,” explains James. Before every race, the Pilot Course – the test driver – has to approve the course. 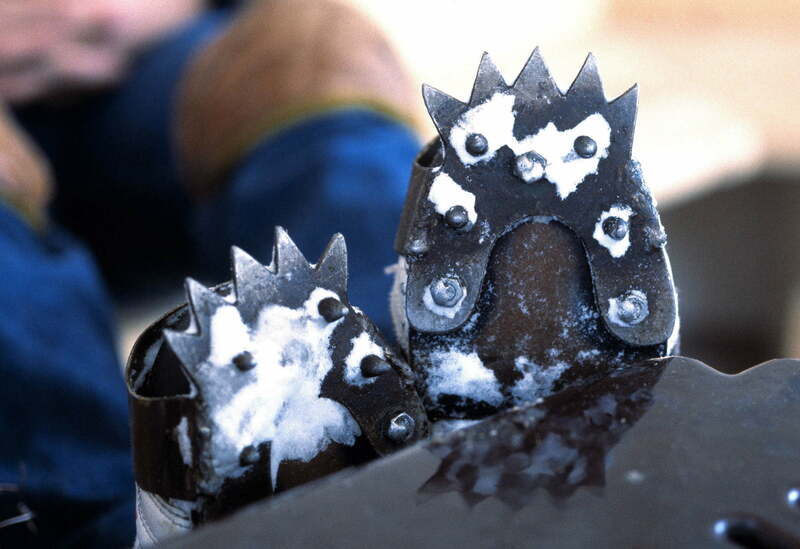 Like all the riders, the Sunleys prepared their toboggans the day before, grinding and polishing the runners. The tension is mounting, along with their concentration. The racers are warming up and putting on their protective clothing – tight skinsuits, not unlike the kind worn for cross-country skiing – in the dressing room. 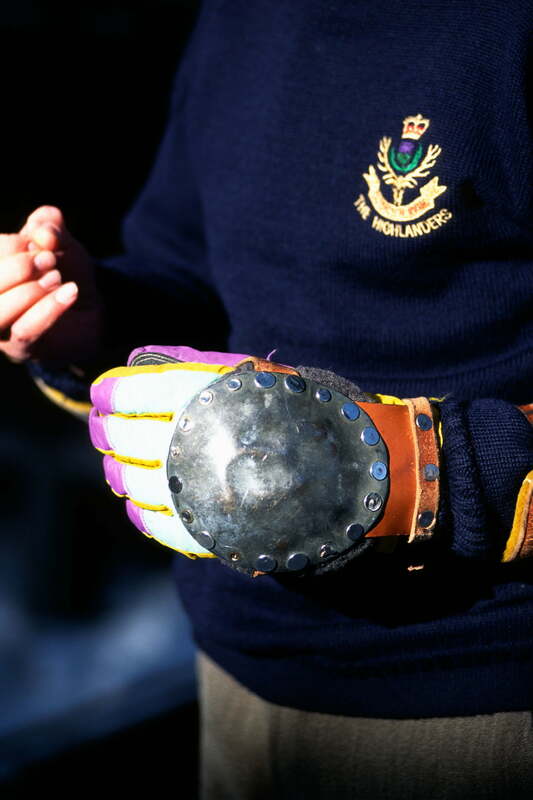 Amateurs are advised to wear strong clothing such as tweed or knickerbockers. It’s British after all. There are two starting points for the Cresta Run. “Top” starts above the old Catholic church of St. Mauritius near the Kulm Hotel, and heads for the finish over 1,214 metres with an altitude difference of 157 metres. The course record is 49.92 seconds, held by Lord Clifton Wrottesley since 2015. The starting point “Junction”, which shortens the course by one-quarter, is by the Cresta Clubhouse. “The Top course has a gradient of an average of 20%, maximum 35%, is faster, and has another three corners due to its length. On Top, the speed reached at the point where Junction begins is already approaching 90 km/h. The atmosphere is completely different. Everything looks blurred, and you can feel the vibration in your abdomen. Once you’ve got the most dangerous corner, ‘Shuttlecock’, behind you, you can breathe again. But then at the finish you’ve got to manage to stop from this tremendous speed,” explains James. 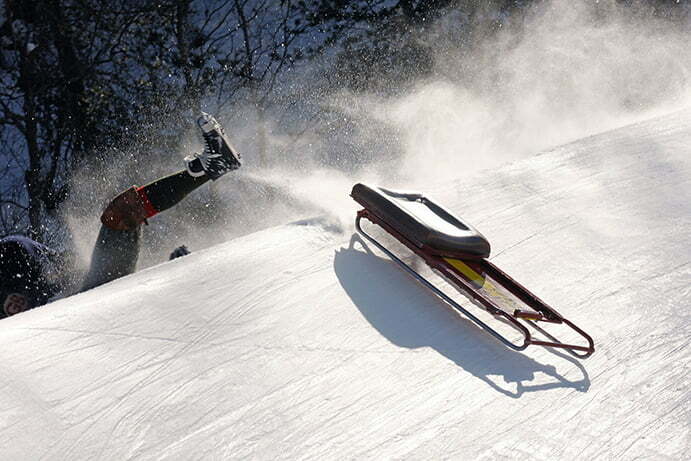 The Cresta season starts just before Christmas, and continues until the first weekend in March. In this time, there are some 12,000 descents. Casper is currently Tower Boy. He helps in the Club as a volunteer during the Cresta season. And, together with the secretary, the commentator in the control tower, he controls the race from above. The spectacle is monitored by 16 cameras, and the organisers are in constant radio contact. “It’s usually completely quiet, but things can get hectic. The most important thing is the athletes’ safety,” explains Casper. Positioned along the course are up to 12 members of staff from the Seiler company. Every year they construct the course by hand anew, and from 6am every day they are out there maintaining it. The Cresta season starts just before Christmas, and continues until the first weekend in March. In this time, there are some 12,000 descents. Races take place every week on Wednesdays, Saturdays and Sundays, usually named after a former member. James has won the Blue Riband (colloquial term for the Grand National) three times. The other days are used for practice. The winners are celebrated fittingly after the races. 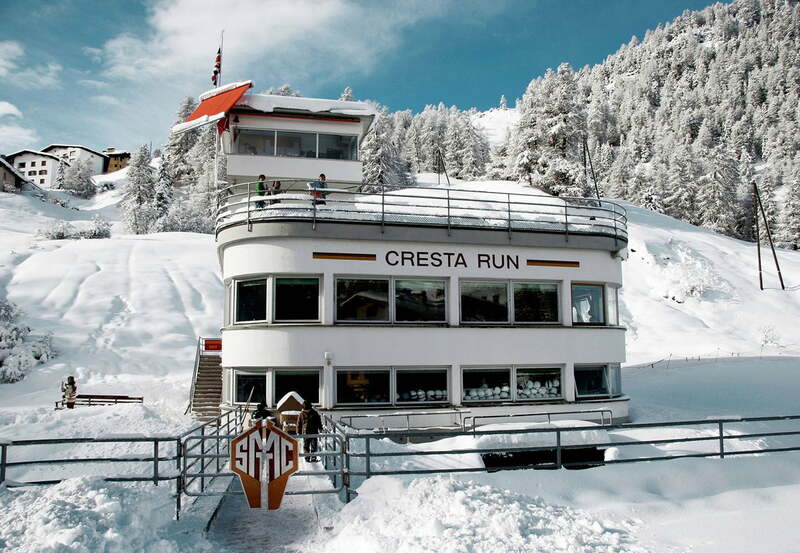 “The Sunny Bar at the Kulm Hotel is the spiritual home of the Cresta, and it’s where the prizes are presented after each race, followed by a lunch,” explains James. There is no prize money, but there are little trophies and a small bottle of champagne. The Cresta is all about rituals. One is that on achieving certain times, racers are given pullovers with different stripes. Not a ritual but a warning are the three loud peals of a bell that can be heard after someone falls off at the famous Shuttlecock Corner. With a hand signal the racer then indicates that he is all right. There is even the “Shuttlecock Club”, named after the corner and open to anyone who has ever fallen off at this legendary corner. Another ritual is the Firework: after the presentation ceremony, all the men who fell off at Shuttlecock that day have to jump up in the air three times and, gesticulating wildly, loudly imitate a firework. Cresta Run participants race head-first down an icy racing track at incredible speeds on a sled called “Toboggan“ towards the finish in Celerina. And what about the rumour that women are not allowed to ride the Cresta? “Ladies not admitted” – as the red-and-yellow sign on the door to the Cresta riders’ changing rooms proclaims. And it’s true: ladies have not been allowed to participate in the official races since 1929; they may only do so once a year, on the last day of the season. However, they are more than welcome in the bar and to offer encouragement along the course, and are also able to go anywhere else. There are, in fact, 250 female “non-active members” of the SMTC. Because whether you are a bold Cresta rider or enthusiastic observer, everyone should experience the Cresta Run at least once in his or her lifetime.